Patrick Hayes was born on November 20, 1867. He was ordained from St. Joseph’s Seminary, Troy, NY, in 1892, and was sent to Catholic University for further study. When he returned to New York, he was appointed to St. Gabriel’s Church as an assistant to then-Monsignor John Farley. 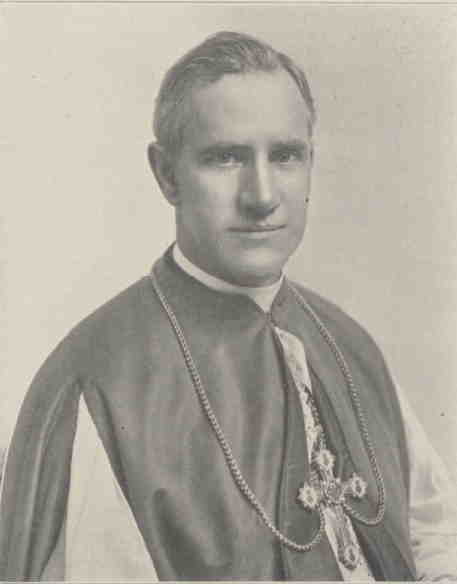 When Farley was appointed Archbishop of New York, Hayes served as his secretary, before becoming Chancellor of the Archdiocese in 1903. He was elevated to Auxiliary Bishop in 1914. When Hayes was appointed Military Bishop, he was offered a ranking position in the U.S. military, but declined, ultimately believing he could do more good for his flock if he remained a private citizen. As bishop of the Military Diocese, Hayes oversaw the spiritual care of all of the Catholics in the armed forces. In the Spring of 1918, Bishop Hayes visited military camps up and down the East Coast, and in the Summer toured the Pacific Coast and Texas, usually in the company of the vicar-general for that vicariate. He would travel by train at night and spend the day in the camps. During this tour, he performed confirmations for servicemen, celebrated mass, and visited hospitals. He was expected to tour the Overseas Vicariate for two months in the Fall of 1918, but remained in New York because of the death of Cardinal John Farley on September 17, 1918. After Hayes was elevated to Archbishop of New York, many of his duties fell to his chancellor, Msgr. George J. Waring. Courtesy National Catholic War Council Collection, Catholic University of America. George Waring was born on January 15, 1872. He was ordained from St. Joseph’s Seminary, Dunwoodie, in 1903, and assigned by the Archbishop of Dubuque, IA, to St. Mary’s Church in Marshalltown, IA. 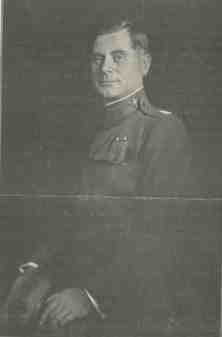 In 1904, he was commissioned as a chaplain in the Army, and assigned to the 11th Calvary. In 1915, he was assigned to Governors Island, New York, in his role of chaplain, and in 1918 was appointed Chancellor and Vicar-General of the new Military Diocese. In October 1918, he toured the Overseas Vicariate as a Delegate Extraordinary for Chaplain Bishop Hayes, who was unable to travel because of the recent death of New York’s Cardinal John Farley. He resigned from the Army as a Major on September 1, 1920, but continued in his role as Chancellor of the Military Ordinariate.